Dimensions: 8 x 11 in. 4 large bags (7-7/8 x 9-7/8 in) in 2 different patterns, 4 medium bags (3-7/8 x 7-1/2 in) in 2 different patterns, 4 small bags (3-1/4 x 5-1/4 in) in 2 different patterns, and sticker sheet. 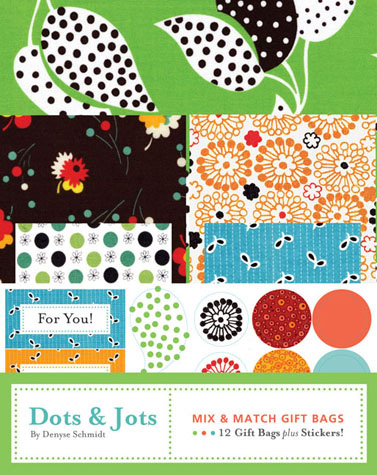 Fabric designer Denyse Schmidt continues her gorgeous Dots & Jots line with this collection of sumptuous and sweet gift bags.